A beautiful rose in my parents’ garden. Back to where it all started (this old picnic table)! My momma’s homemade muesli with blueberries, bananas, watermelon and unsweetened almond milk. Oh how I missed Rapaki! Gosh I love NZ’s nature walks! A personalised freshly squeezed juice from Green Spot at South City Mall. Yesterday I had an idea. One that both frightens me and makes me excited. I thought, why don’t I compile a picture book of my time here? Wouldn’t that be the very best way of closing a chapter? No pun intended. Okay, pun totally intended. What do you think? With anecdotes and recipes and maybe one or two poems (because I hear poems don’t really sell). Not that money is a focus for me whatsoever. I swear to God, all I want to do is create. I have dreamt of publishing a book ever since I was a little widdle head-scarf wearing school girl. Won’t you please help? Any ideas, any contacts, any advice, anything at all because I really don’t know one thing about doing this. Will you buy it? Is it a good idea? What do you want to see in it? Who should I contact? How do I do this? 2. I made granola in a frying pan under 10 minutes and so can/should you. First add the nuts to a large dry frying pan on medium heat. Add the oats next and continue slaving, I mean stirring. Lastly, add the dried fruit, spices, sweeter and coconut oil then turn down the heat. You guessed it, stir until well combined. The granola is ready when it has browned (not burnt) and smells delicious! Serve with your favourite milk and fresh fruit or, alternatively; soak overnight with your milk or water for a delicious bircher! 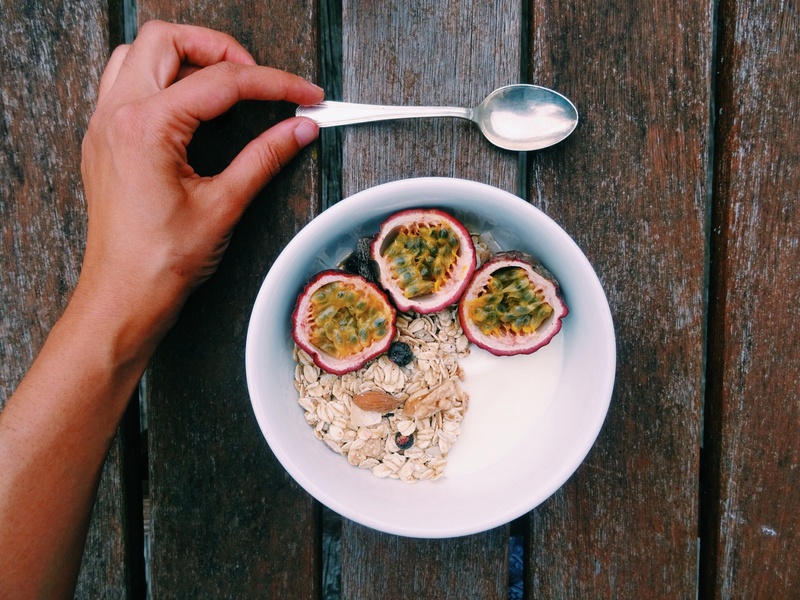 Are you still eating your granola out of a packet? If so, I’m seriously disappointed! Not only is making your own granola/muesli surprisingly easy, it’s undoubtedly better for you too! 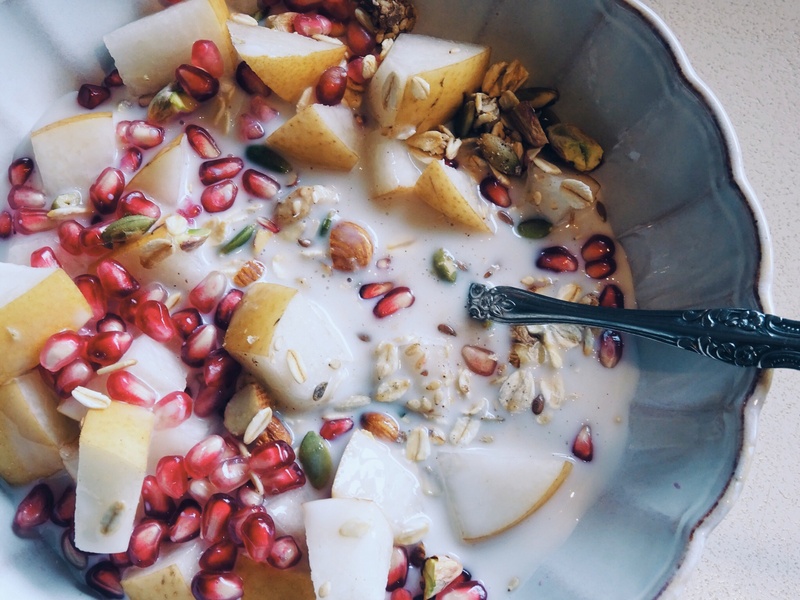 This morning, I’m starting off my Hump Day with a bowl of home-made muesli (recipe found here), pro-biotic coconut yoghurt and deliciously sweet passion-fruit! What about you? We all know that breakfast is the most important meal of the day. Why? Breakfast provides your brain and body with fuel/energy after an overnight fast – that’s where its name originates, breaking the fast! Without breakfast you are effectively running on empty, like trying to start the car with no petrol (just call me the Cliche Queen). 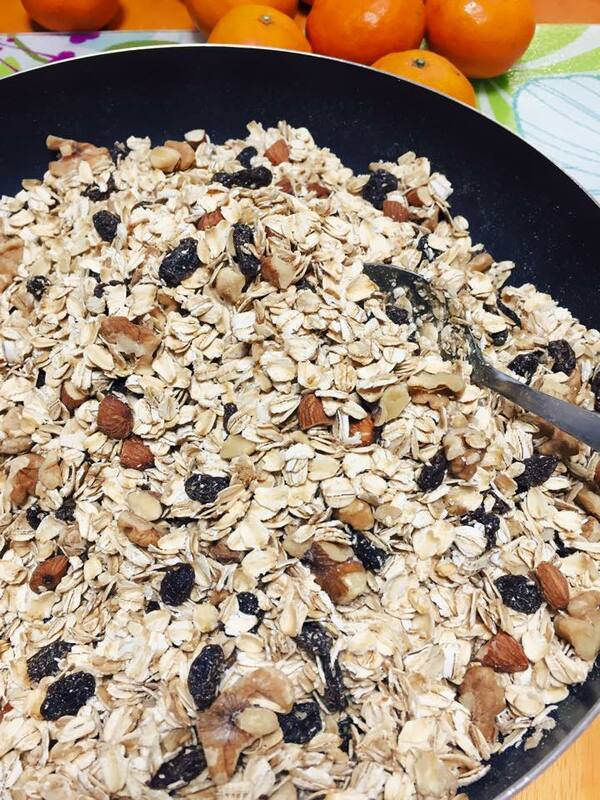 I don’t think most people realise just how EASY it is to make your own granola! 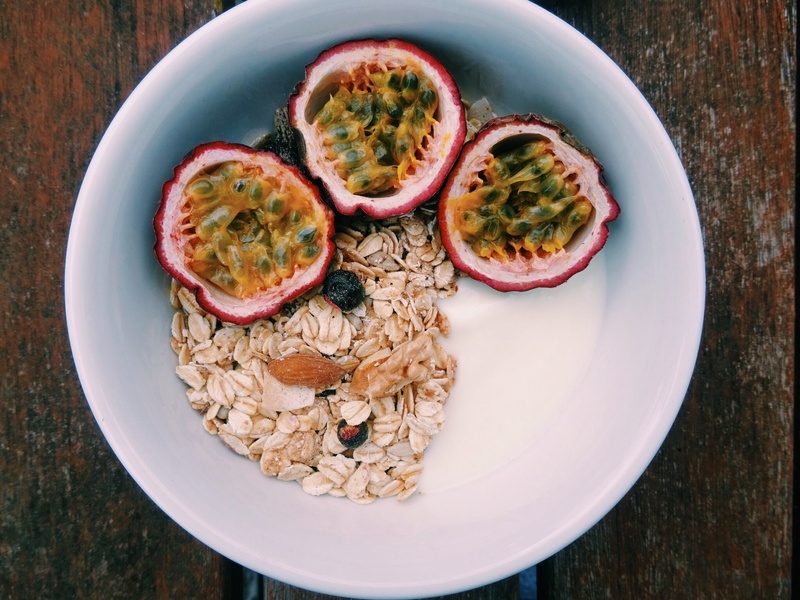 Stop buying packaged cereal labelled “healthy” – it’s not! Muhammad Ali once said: “suffer now and live the rest of your life as a champion”. Well I say, sacrifice 40ish minutes today and spend the next two weeks eating the “breakfast of champions”. PS This recipe is super adaptable so feel free to pretty much, use whatever you like! The most time-consuming part is to roughly chop the nuts and dried fruit – so do that first. In a large bowl, add the oats, nuts, seeds, coconut, cinnamon, honey and coconut oil – stir well. Spread the oat mixture onto a large baking tray; smooth out. Bake for around 25 minutes, every five minutes or so take the granola out, give it a stir, then smooth it down with a wooden spoon and put it back in the oven. When the granola is golden and fragrant, remove from oven and mix in dried fruit; let cool. Store leftover granola in an airtight container – lasts about 2 weeks unless you accidently eat the whole thing, of course!